When our kids celebrate their birthdays we try to surprise them with a birthday sign. Last year I made a sign for our front door that greeted our son when he got home from school. This year I bought the new Crayola Washable Window Crayons to give a try. When he got up this morning he was greeted with a birthday wish on the mirror. Just a side note: I do like the way the window crayons make a smooth easy mark. They give a more opaque effect than the window markers. I also like how you can color back over the image and it is not removed –unlike the window markers. There are less colors than the markers and the red is more pink than red. However, my daughter has been playing with them and doesn’t seem to mind only having a few colors. I was really concerned after reading the reviews that they would be difficult to clean. I allowed a picture to dry about an hour and then cleaned the window. I did not have any trouble (I use a mixture of vinegar and water to clean my windows and mirrors). I don’t know if allowed to stay on the windows for days if it would then become more difficult to remove. Happy birthday to your son, I hope 17 is his best year ever. I can see so many uses for those window crayons... thanks for the introduction, I only knew about the markers and didn't like the fact that they'd erase themselves if you went back over your lines. I'll have to try these out. I love the idea of leaving a birthday message. ooo....that looks like fun! I want to try. My daughter has a birthday coming up, so we could definitely give these a try. Keeping my fingers (and toes) crossed! sounds like a fun thing for my boys to use to decorate our patio doors. much cuter than dirty fingerprints!! those look nice. I would love to try them. Now these are really COOL! Who would not feel special after seeing a sign just for them! How fun! I used to have the markers and used them all the time- esp at wedding receptions! But they got annoying. I'll be the crayons would be way more fun! What a sweet surprise for the kiddo! I'd love to try these! Just found this site! What a fun way to celebrate! that looks like so much fun. my grandkids would love them. What a great way to celebrate birthdays! The crayons sound (and look) neat. What a nice family tradition! I hadn't heard of these crayons, but they're a great idea. I can't wait to do this for my family members! Thank you for sharing this great idea! I want to win these... birthdays coming up and my kids would love to see some fun messages like these! I teach in a high school Early Childhood Education Careers program. My high school and preschool students would both love to use these washable window crayons! They might also be great for my light table! Oooo, looks fun! That's a great idea for bdays!! Very cool - and love that you did it on the mirror and not on paper! I'll do that for my daughter for her birthday this year! oh wow! i like the way they look. they are neat. Count me in! These look so fun!!!! I have seen these at the craft stores and always wondered if they really worked. Now I am wondering how many things I could use this for. Maybe on glasses at the birthday dinner, as well?! my son is not an avid fan of drawing - these might provide encouragement. What a nice way to celebrate a birthday, your som must feel so special! I would like to win and surprise my son on his birthday in november. Oh that'll be fun with the kiddos. Fun Stuff!! Awesome picture! What a great mom! This will make kids feel so special -- great idea!! I love this Idea and would love to try them out for my husbands birthday next month. I think my daughter would love them too. What a fun idea! I always enjoy hearing about various family traditions. So fun! I didn't even know these existed. I leave notes on the mirror all the time in a post it. This would be much more fun. I have wipes for the mirrors--I wonder if that would take it off. We have always loved messages on mirrors and windows and doors. Birthdays are such fun to celebrate! Sounds like these Crayola washable crayons are a big improvement! Very cool. We have art work on our walls but have a very large slider along the backside of our house which is the only surface we are really able to decorate for parties. Love the idea! My 2 & 3 year old recently tried coloring on the windows with regular crayons, but doing it with these would've made mama a whole lot happier!! These sound like fun to try. They can't be any harder to remove from the window than the dog slobber I currently have! These would be great for any occasion! I'm thinking Christmas and Halloween. Sounds like fun! We would love these! These crayons are fantastic! What great ideas and traditions. My daughter would love these (as would I)! What a neat idea! Please add my name to the drawing. Thanks! What a great idea! Not only is this a great idea for birthdays, but my daughter would also love using them! I would love to try these. I love your site. Thank you for all the fantastic ideas. I think these are great. It's good to do special things for our children, especially on their birthday. I think it makes special memories. And a very Happy Birthday to Blake! So cute- please enter me! my daughter would have sooo fun with this!!!! hope we win. Love this idea! I will definitely don this on the bathroom mirror for my kiddoes' birthdays now. I just saw these at the store the other day and wondered how they would go over. I hope I win! I'd love these! Birthday's are the best! It's mine today!!! LOVE this idea! My oldest turns 17 as well, in November...We make a big sign, with the gifts...and do their pictures with that sign...Love the idea, of the mirror though!!! Great idea. I totally see these being used for any occasion. An easy way to "mask" all the fingerprints off the glass slider doors. Another good idea is to leave them in the bathroom and have your guest autograph the mirror. easy enough to do just for that day/night and then clean bathroom mirrow tomorrow! I like it. I'll wait to see if I win some markers and if not, then I will definately go out to buy some. Maybe I could use my Michael's coupons and get 40 % off,,,,hey not bad! What a fun product! My son would think it was really cool to color on the windows! I love this idea! Birthdays are coming up in November & December. I'll have to try it. In the past, I've made paper lanterns and strung them up around the door and in the room. I've also hung streamers and balloons for when my daughters wake up. We would love to try these! My daughter keeps taking my gel decorations off my front door, so it might be fun to let her decorate on her own! Love the birthday sign tradition too! This is a really nice tradition! Oh those look like so much fun. I think all my windows would definitely get cleaned if my daughters got a hold of those. Happy birthday to your son!! I think this is a great Birthday tradition. Simple and inexpensive too. We are so into birthday, anniversary, Christmas, Welcome Home, Happy Easter signs!! My story about how important these signs are to us (read...me) that the day my son returned from England after a four month co-op placement, he had to stand on the porch for 10 minutes until we finished the "Welcome Home, Sweetie" sign!! Our sons are the same age. Wish I had known about the window markers, I'm sorta behind on stuff like this. These Are so cool! I wish I would have had them when my son had his 15th birthday! I wrote on my hubby's car last year for his birthday with those "car" markers and we like to never got it off! I will never do that again! These look like they are just perfect and you can even write neatly with them! Thanks for the share! I love these markers! I can think of all kinds of stuff to do with them for my home preschool...thanks for the ideas! It was my son's 4th bday yesterday, I wish I would have known about the Crayola Washable Window Crayons before, I would have loved to create a message for my BIG boy! Next year I'll be doing just that! Thanks for the great idea!! What an awesome giveaway - thank you!! I saw these at the store the other day & wondered how well they would work? I think the possibilities would be endless with these & know my grandkids would have a blast with them! What a great idea! Hope your son has a wonderful birthday! These look like they would be really fun for my grandchildren to use. Can't wait to try some. I have never seen these! Where would I find them? What a great idea to use them for. Happy Birthday to your son! HOw fitting that my daughter's birthday is today! I think I will go get those markers for her party tomorrow! Thanks! These are amazing! They would be so much fun for my sons to play with. Love this idea. We have a bday coming up in November ans will give this idea a try. Thanks for the post. How Cool! I am definitely stealing the idea! Great idea! We have the markers but have not tried the crayons. I left the markers on the window for a little over 2 weeks and they cleaned up well with a vinegar-based window cleaner. What a great idea! Can't wait to try these, thanks for sharing. You have fabulous talent by the way. I can't imagine what it would look like it I tried to make a HB sign like that. oh - would love to try these, they look so cool! With 5 kids between the ages of 3-11, this would be a great activity for all of them on the up and coming winter months!!! how fudging cool are those?!?! love the bday message idea! what a great way to surprise someone!! ohhh i would love these! i have 2 birthday's coming up and i might have to steal this idea! I'd love to try these. On my grandson's birthday I've been cutting a big number out of cardstock and he loves having his photo taken with it. He'd like this window idea, too! Another awesome idea. Last weekend I picked up some of the Crayola Fabric Markers you mentioned in a post and let my son decorate a t-shirt with those; looks like I'll be getting some of these too, unless I win. Woo Hoo! 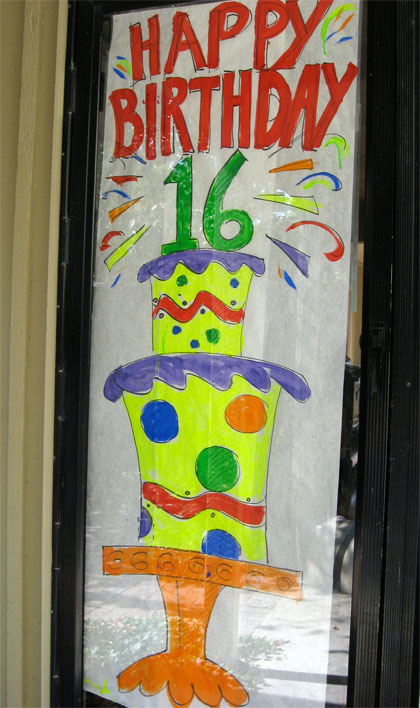 Thanks for the GREAT idea...my daughters bday is in Nov. and I have a HUGE kitchen window I can use as my 'canvas'. My daughter's birthday is coming up on October 7th! She'd love these as a surprise! She's an artist at heart and loves to draw. I'd love to surprise her with a sign on the window or front door!!! Thanks for the opportunity! Pick me, please!!! That s so cool!! LOVE IT!!! Awesome idea! My kids would love it. The birthday signs look great. What a fun tradition! I would love to try out the window crayons. These are so neat. I'd love to try them. What a great idea! We would love to try them out! These look like a lot of fun! My son would love them to color on the kitchen window by his chair. He already has colored on the wall there...haha!! Thanks for the chance! I would LOVE to try those. Win or no win, those will definitely be coloring my windows soon! Happy Birthday, Blake! How fun!!! Would love to give them a try! I love the markers-- can't wait to buy the crayons. We've had beautiful art work on the windows to great the moms and dads at pick up time and to great my kids and husband as well. We've got 4 birthdays in out family of 5 between Thanksgving & Christmas. I'd love to try them out! I've never seen window crayons! How cute! Happy Birthday to your son! Cute idea! I think the window crayons would be a great Christmas gift for my nieces! The crayons sound fun, I would love to try them! What a fun Idea! 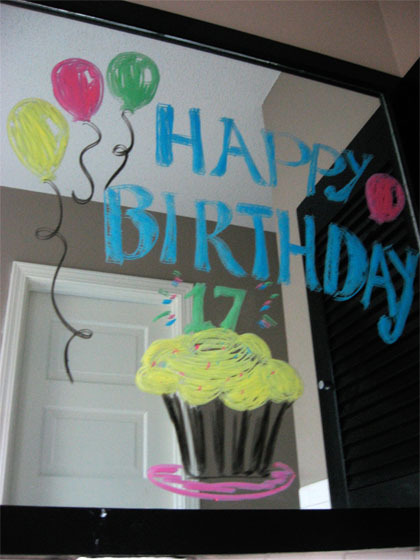 Today is my birthday and I wish I had something like that on my mirror!! What a fabulous giveaway! I would love to give these a try. We have a few of the markers, but I didn't know they made crayons! Those crayons look like so much fun! I love the mirror birthday sign! Too cute! These would be great for my 4 yr. old while I homeschool her brothers! Thank you for highlighting them for us! I am sure you making the day extra special by simply greeting them with a sign of some sort on their birthdays will be a wonderful memory to think back on for many years! I am always impressed with your design talent, but I'm super-duper impressed with your free hand ability on a mirror! What lucky kids you have! You've definately made your positive mark on our house by making me, the momma, happy and want to do neat things for my family. Thanks for making homemaking a true art! I would love to try these for my son's 7th birthday coming up in a couple of weeks. How fun!!! I think the kiddos in my classroom would LOVE those!!! absolutely want some of these. they would be perfect for writing on the car windows when we go to my son's away football games. I have a little birthday coming up. I like your idea. I might have to start the sign idea. FUN!!! Can I play, too? Aww! Happy Birthday Blake! Those markers look really neat! Definitely need to try them. Also love the idea on a birthday surprise message! Wow! Looks like great fun for kids! I would love to try those! Thanks for the chance! I can't wait to try this with my kids' birthdays. Thanks so much for sharing with us! Fun, fun. I'd love to be one of the ones to try out the window crayons. Great idea! We've been using the window markers to make writing more fun, and the Window Crayons would add a NEW element of fun to a mundane task! These look like fun. Thanks! I love that idea. And they are never to old for it. Those look super and the picture is so colorful and smile making. With clean up so much easier than water based tempera. Thanks for the opportunity to get some. Ooooh, I've been dying to give those a try! This has to be one of the coolest birthday ideas I have ever heard of! Thanks for the inspiration! The crayons sound fun, thanks for the chance to win some. Have a wonderful fun filled day blake!!!!! Oh man! My kids would LOVE these. And secretly their mama would love to "help" them with their window art! These look like so much fun! My kids and I would love to try these out! Thanks for the giveaway. This sounds so fun! I can think of a million uses for them! Oh I'd love to try these! We do a lot of car window painting. I'd love to try these out. That sure does beat lipstick! I love it. They look like a lot of fun. I do like the look of them better than the markers. These would be so much fun to use in my 1st grade classroom! Looks like fun! I want to try! What a great idea about the birthday signs! And I know my little boy would love those crayons, too! How fun. We just moved and have a glass front door, so these would be perfect. We'd love to try these! What a fantastic idea! It's a great family tradition...I think I will try it out next year. I've never heard of the window crayons. Would love to try them. I have used the markers in the past & didn't realize they now have crayons for the mirrors/windows! Thanks for sharing. I would love to give them a try. My kids would love these and I would love an easy clean up. We have always used acrylic paints in the past and they don't always come off completely. What a fun product to try out! And a great family tradition to have to celebrate birthdays. Thanks! Making a sign is a great idea. I like those crayons, too...I had never thought about using something like that to do that. What a fun tradition. These are fantastic and I KNOW my daughter would love them! I'd love to win those so I can write happy birthday to my little three year old! What a great happy birthday message. I'd never even heard of window crayons till I read your post (I had heard of window markers though but have never tried them). what a great idea!! and so cute! hope i win!! I love this concept, I have made signs before also, but this would be really fun to try....for me and my kids:) I would love to win a box! Very cool! We have the window markers, but they just don't show up nearly as bright and colorful as the crayons seem to! This would be great for my classroom! Would love a box! I love leaving notes in random places, especially on special occasions, these crayons would be awesome! I can only imagine this would motivate me to actually clean my windows. Great idea! Oh this would be cool to try. We have lots of windows in out house and my girls would have a ball. What a fun giveaway. Thanks. Those look like fun and have lots of options for use! Holidays, birthdays, just because notes! :) Thanks for the chance! we already have and love the window markers and would be very excited to try out the window crayons! fun giveaway!!! We celebrate my daughter's 1st birthday later this month! Wow! My two boys would love those! They would be great for "Brush your teeth" reminders on the bathroom mirror! What a fabulous product and a creative way to use them. I cannot wait to surprise my boys and see them smile. Thank you. I was just thinking "I gotta get me some of those!" My kids and I would have ablastwith them. how cool! I heard about these. Would love to get some. Thanks! I have two kids birthday parties the month of October....this could really come in handy. Thanks a bunch. thanks for the chance, would love to try these! These would be great for my little guys upcoming birthday! Oh I want to use these for my daughters 1st Birthday Party!!!! Oh! My girl´s bday is today!!! This is a great idea, would love to try those crayons! As usual your blog is fantastic! Thanks Crayola for the chance (and you)! This would be so much fun for me and my little sweet pea!!! Would love to give the crayons a try! those look like SO much fun!! Me and my girls would love these! Thanks for the drawing! Happy Birthday Blake!! Crayola always comes up with more new and interesing ways to expand our kids imaginations. Cant wait to try them. My son would have so much fun with these! What a neat idea! I would love to win! I LOVE these crayons. I have left the drawing on for days and have had no problem getting it off with windex. They are so fun! You can also write on car windows with them . . . so it is fun to leave messages for people! What a wonderful suprise to wake up to! My little girls birthday is next week, big #6! I love you ideas. Please keep them coming! What a good mom. :) I've been wanting to let my kids try these for holidays. These are perfect since my kids asked just yesterday if they could draw on the windows! What a great idea! We have a patio door that separates our living room from our toyroom/four-season front porch that I'm intending to someday kinda hide from the living room side, but those crayons would be perfect for the girls to "decorate" the patio door from their side! Those look pretty cool ... what a great way to greet that special someone!! Happy Birthday Blake! What a sweet idea... I made a birthday banner that we display for every birthday, but this would be a fun surprise and something special for each person... and winning would be just in time for our little one's Oct. 1 bday. Great idea thanks! My kids play with the window markers all the time, but I haven't seen the crayons yet. We would love to win some ;) ! So great... we love doing our windows... My girls would LOVE this! I've heard about these! I would love to try! Crayola is one of the name brands I always stick with. "Generic" just doesn't compare! So cool. My kids would love these including my husband. What a fab idea! It is hard to surprise teenagers, bet he loved it!! Cute idea! My kids would get a kick out of writing on windows and mirrors! What a great Mom . . . and a great son! Happy Birthday, Blake! Special start to a special day! This is so cool! I love these ideas and those crayons! Oooh, my kids will be able to color on the windows without being naughty! Love it! This is such a clever idea! I would love to try this! I made my son a fabric banner that says Hooray for D. I'll be hanging it up throughout his life (including birthdays) as he accomplishes something great! What a fun way to celebrate birthdays! Thanks for sharing! Those signs are so cute, can I hire you to be my in-house artist for all birthdays? Please enter me in the contest...I am hoping that with the crayons comes the ability to be a great artist like you. How cool are these!?! They remind me of the ones you see in restaurants that they use to write the daily special. I'd have a ton of fun with these! Those look like fun! My kids would go to town using those markers on the windows! Too bad the red isn't a true red, but would still be great fun for my little one! Oh dear number one never wins but these sound so cool - would love to have a box!